A today wave has decimated the San Diego zoo, unleashing the animals. Now they are rampaging the city and only you and your band of intrepid friends can stop them. Fight back waves upon wave of deadly foes. But wait ... why are they attacking in waves? Somebody must be behind them, organising them, for their own nefarious ends. Thanks to all who played and ranked my game. I'm glad that quite a few people had fun with the game. It was a "clicker" and so the usual downsides apply. Sorry for those that don't enjoy those games and had to break their mouses (and fingers) to play! I'm pretty happy with the core game but there were several areas that I really needed more time as mentioned by a number of players. Someone mentioned that they got killed out-of-the-blue. This was probably the snake, that deals a ton of damage with a very slow wind-up. But the player is right. The idea that different beasts would have different characteristics and so you would have to choose which order to kill them was quite central to making this more deep than just a clicker. However, I didn't have enough time to balance this part. With so many different beasts, power ups and dimensions I got quite lost in how to adjust the attack, cost, damage, AC elements to create a compelling curve to the game. 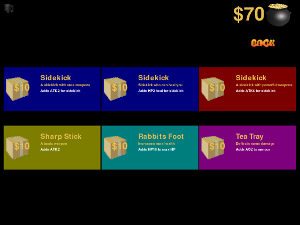 Most clickers get around this by just making things really "expensive" and using the players time (and boredom level!) to balance. I wanted to avoid this but this needed more polish. I wanted the game to be fun and to play with the Sharknado theme but I didn't get to scratch too much below the surface on this. I was looking to have splash screens when side-kicks and bosses entered the game and also an ongoing storyline that was revealed as you levelled. I also needed some animation. The beast graphics and side-kicks were generated from stock photos and the lunar pic online tool (https://www298.lunapic.com/editor/). This allows you to use neural network models to apply artistic styling to photos. It created a really interesting effect but I wanted to go a bit further with animation too. Anyway, overall another fun Pyweek. Thanks to the organisers and all the other competitors. Your games were awesome. I'm always amazed at the quality and diversity of entries. Well I finished the game since this is all the time I had this week. I would say I completed all the elements I wanted to include and the game came out quite fun. I added an "easy" and a "hard" mode at the last minute because it should people to see more of the levels. It gets quite crazy after the first few levels and you have to watch the sequencing of the power-ups to be able to survive the boss fights! Good luck to everyone for the rest of the week and I look forward to playing the games. I'll do a gameplay video next week when I'm back online. Added most of the graphics and a good deal of the sound today. This was a very interesting case where the game didn't seem fun at all and then adding the sound transformed it. Still needs major tuning to make it really playable for more than a few minutes but hopefully I will have time to do that tomorrow. Got the end-to-end game working and did some tuning via a monster spreadsheet. The spreadsheet turned the tuning into a bit more of a manageable job but it still needs refining as the game progression is still not right. Tomorrow is graphics and sound implementation which leaves Wednesday (my last day this time) for final tuning. I made good progress but I think I am a bit behind. 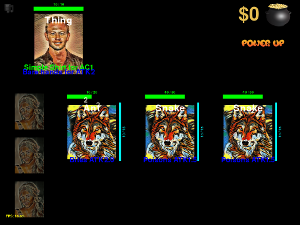 The basics of the game and the power ups are working and it is somewhat playable. Lots of graphics and tuning to go though! 1. I don't have much time this week so I need to be almost done by the end of my Sunday! 2. I realised that there are lots of variables to tune in the game so I'll have to write some kind of simulation mode to avoid having to play it hundreds of times myself!